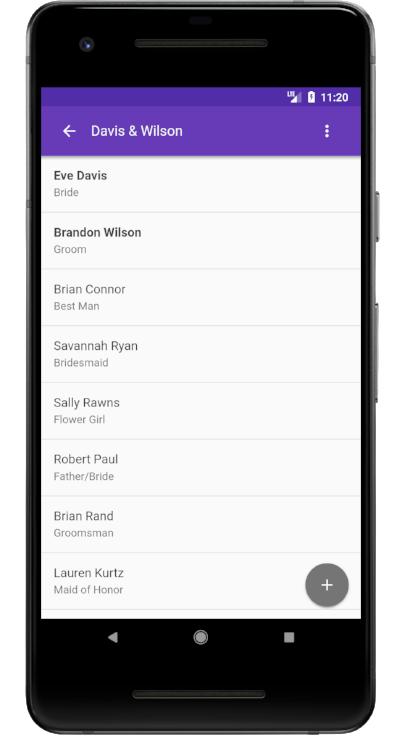 The home screen showcases all present and future weddings, organized by date. Any weddings with past dates are moved to the archive to keep you focused on what's next. Create your schedule in the template using Google Sheets or Excel, then upload it to make loading data easy. When something comes up, just edit an item's time, and have the option of pushing out or pulling in the entire schedule. An easy reference of the names and roles of all the key people involved in the big day, each with optional notes to remember all those little details. Stay organized and never miss even the smallest detail while setting up. As you complete a task, simply check it off. Have confidence in knowing that you won't forget a single thing on wedding day! Vendor running behind? Call or email directly with a tap. Reference floor plans, setup photos, layouts, table numbers, or any document you can imagine you'll need on-site.